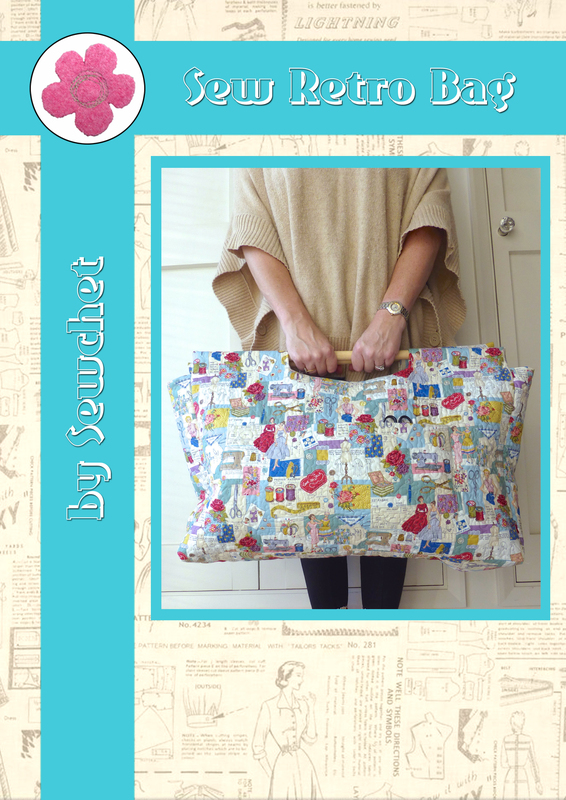 Linking up with Natalie at Threads and Bobbins for this week’s Sunday Sevens – a weekly blog series in photos. 1. Progress on the ‘Scrappy’ blanket has been good. Although I had to buy five more balls of yarn so it’s no longer strictly a scrappy blanket. 2. 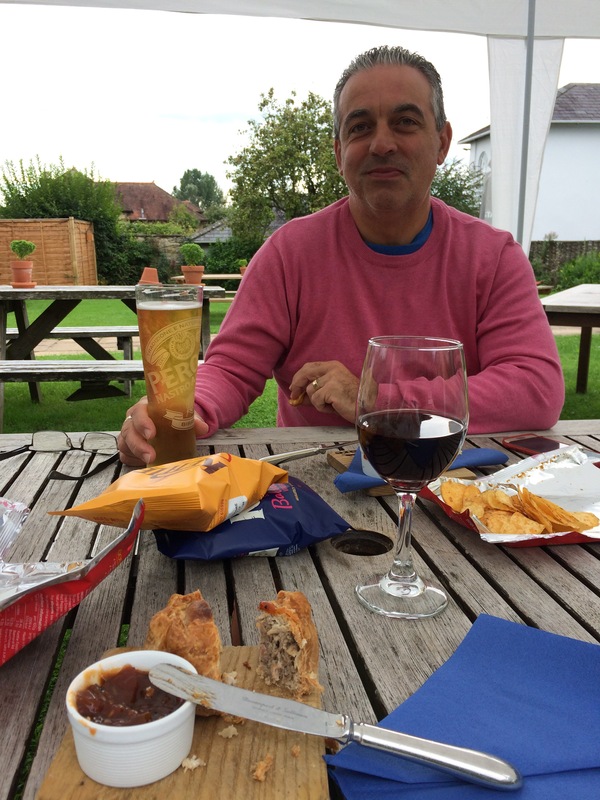 Managed a glass of red and a homemade pork pie at the pub whilst The Boys played in the playing field behind. We even sat in the garden as the rain held off. Still chilly enough for a jumper though. Well, this is 3pm in August! 3. 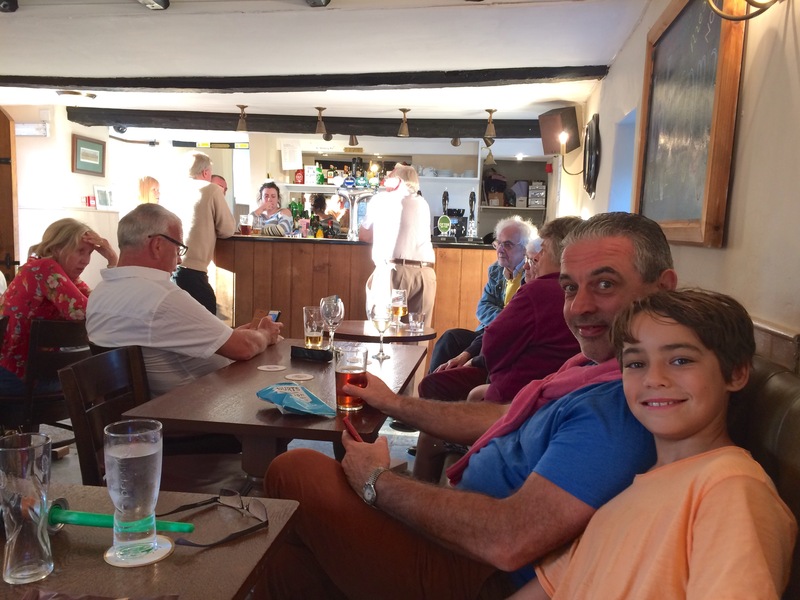 Another day, another pub. Our local has been closed for a couple of months and is now under new management. The Boys took their light sabres to use as guns. As you do. 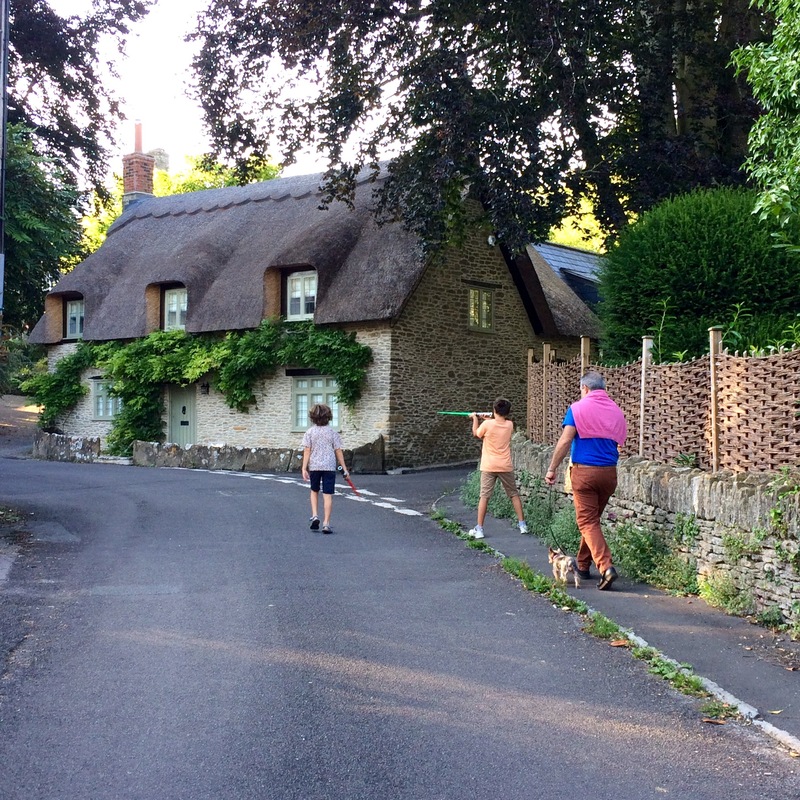 Our walk takes us past this thatched cottage in the village. 4. A pint and a bag of crisps. It should be written into the Human Rights bill. 5. 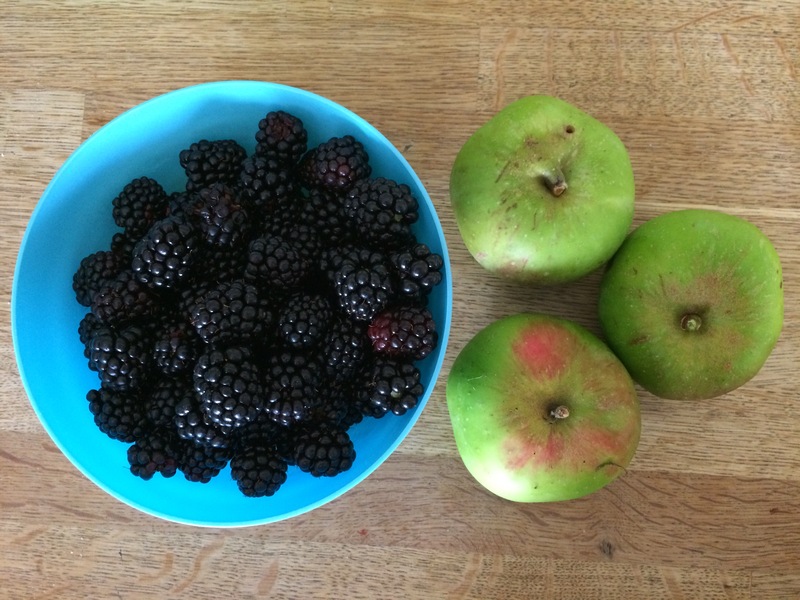 The blackberries are coming thick and fast – I’m picking over three pounds a day from our bush in the garden alone! Good job it’s thornless. The apples are from mum’s tree. 6. 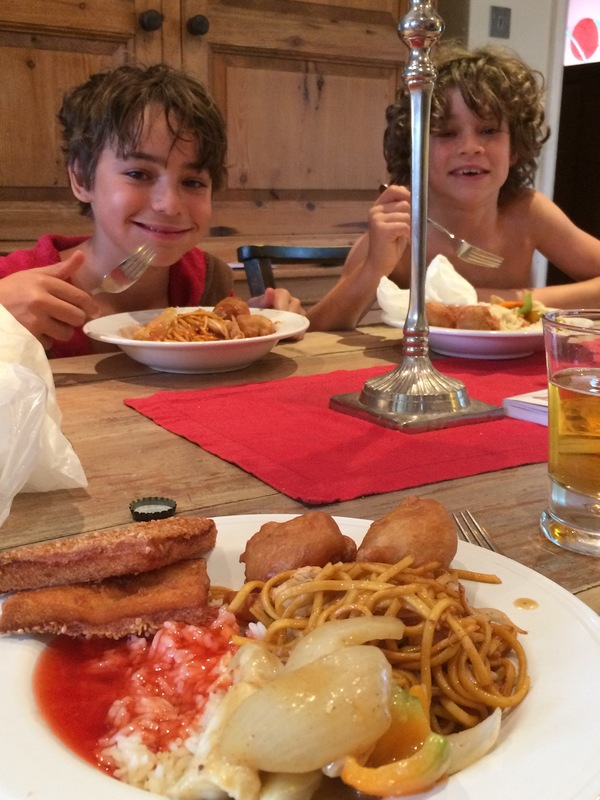 A rare Chinese takeaway – The Boy’s favourite treat. 7. 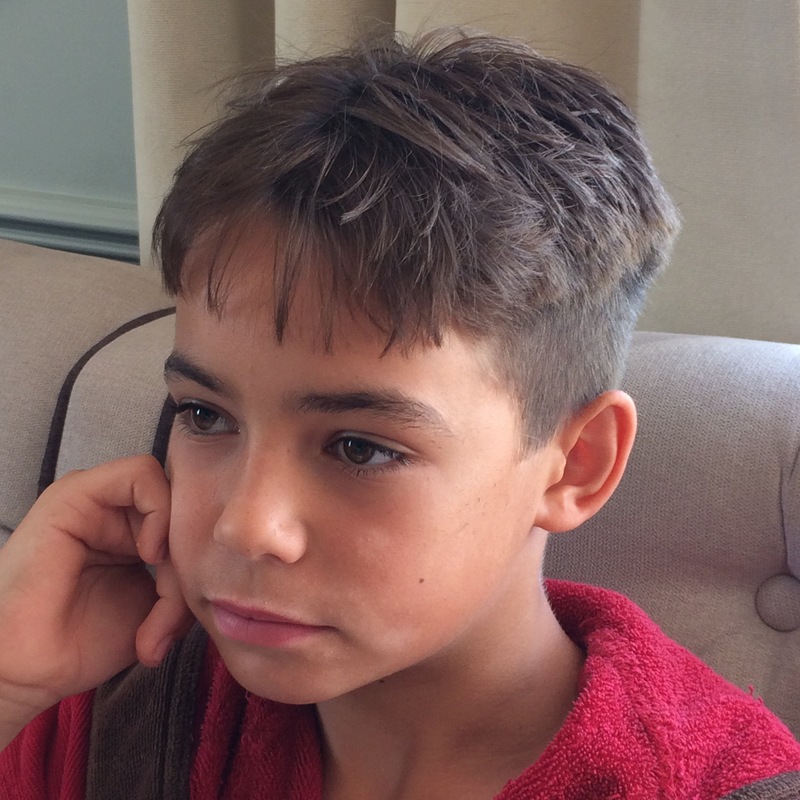 I gave No.2 Son a ‘holiday haircut’. 8. I didn’t realise he had this much to lose! 9. 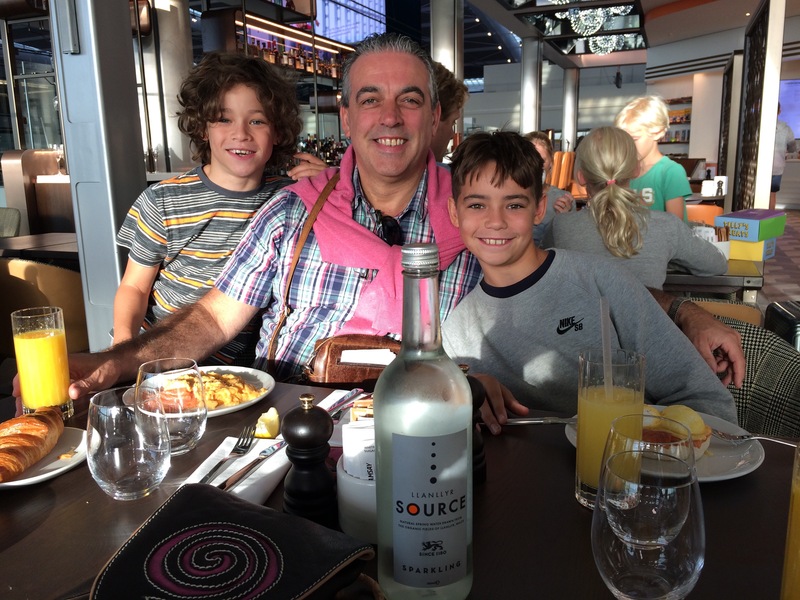 Breakfast at Heathrow airport before heading off to France for the week. It took us an hour and a half to drive to the airport and just forty-five minutes to fly to Paris! 10. 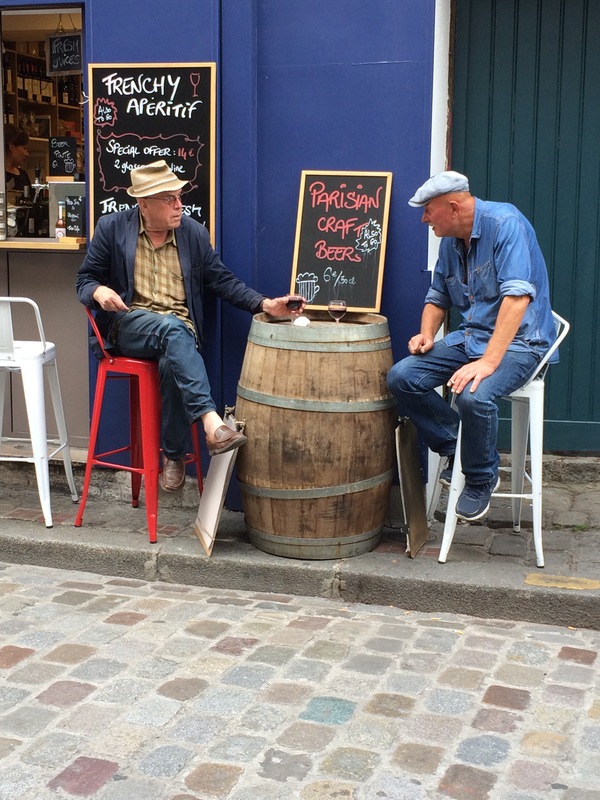 I love France’s café culture. 12. 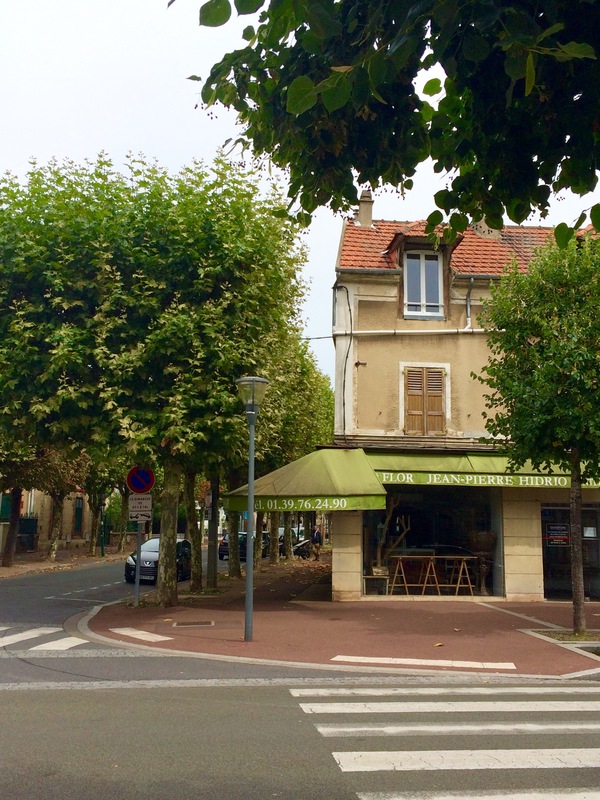 Pretty street corners of the district we stayed in – Croissy sur Seine. 13. 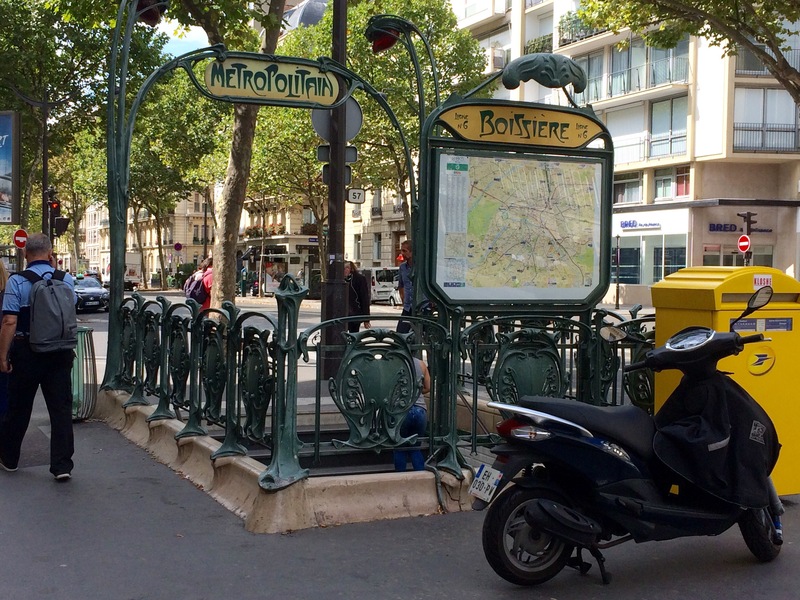 We did the sights, after all, the last time I visited Paris was as a schoolgirl back in 1979! 16. 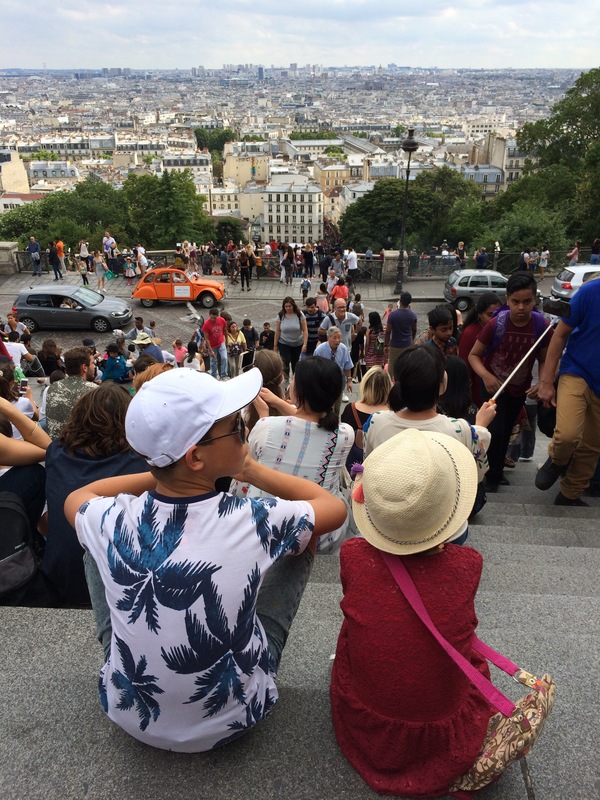 If you turn around 180 degrees, the view over Paris from the Sacre Coeur is breathtaking. Here are two of the Littlies taking a break – we walked eight miles that day! 18. 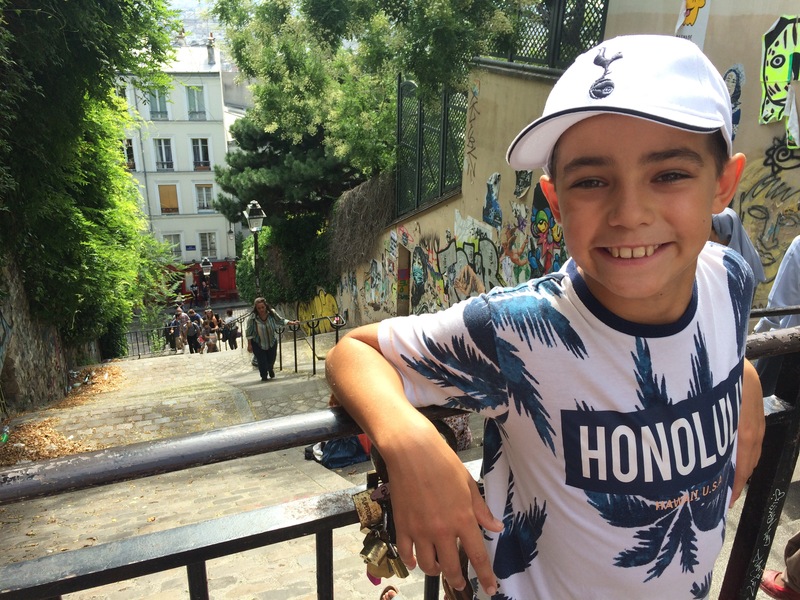 We walked the quick way up to the Montmartre district (for which read ‘steep’). Mr. H-L can be seen about half way up the steps struggling to keep up! 19. 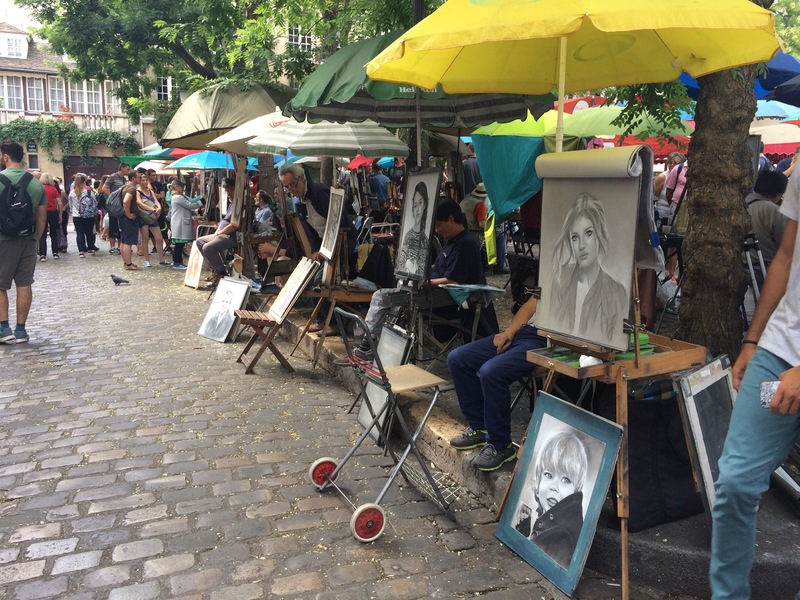 Montmartre is all about the artists – and they are everywhere. 20. 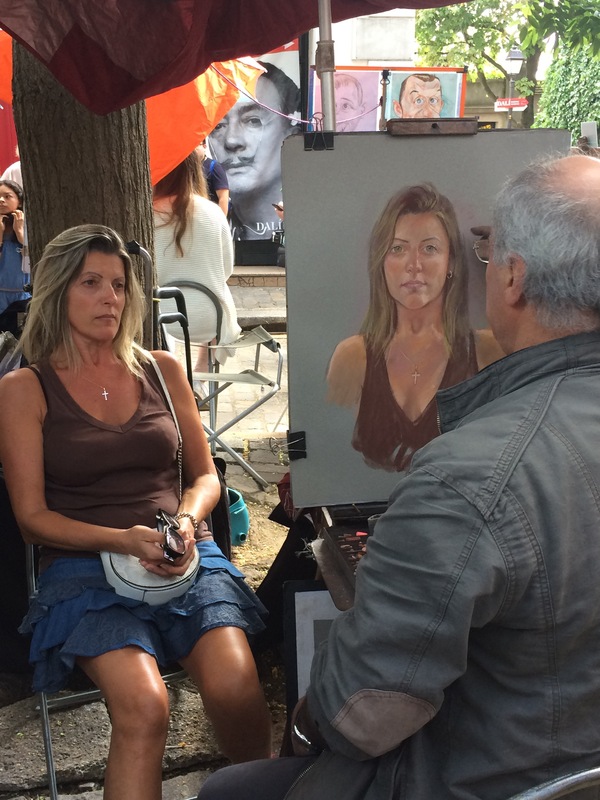 It was fascinating to watch portraits come together before your very eyes. 21. 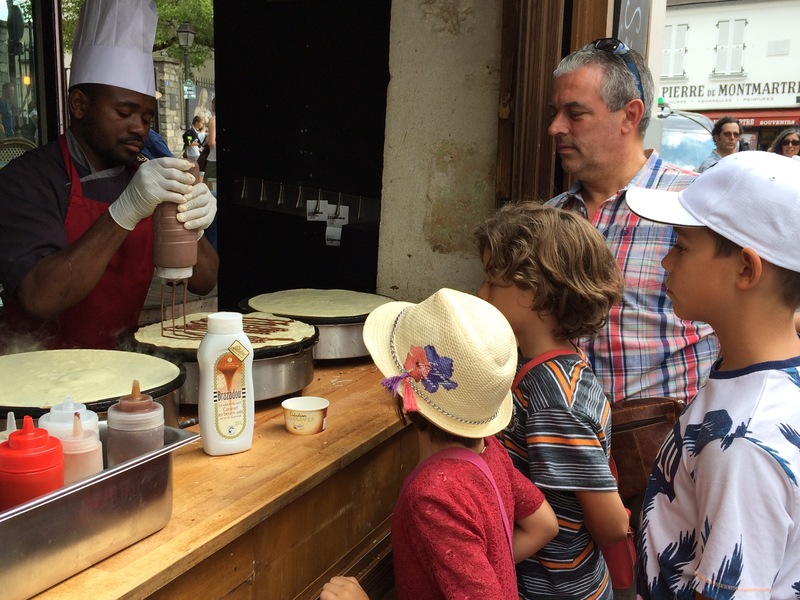 Of course, we HAD to have chocolate and banana crepes while we were there! 22. Relaxing with the locals. 23. 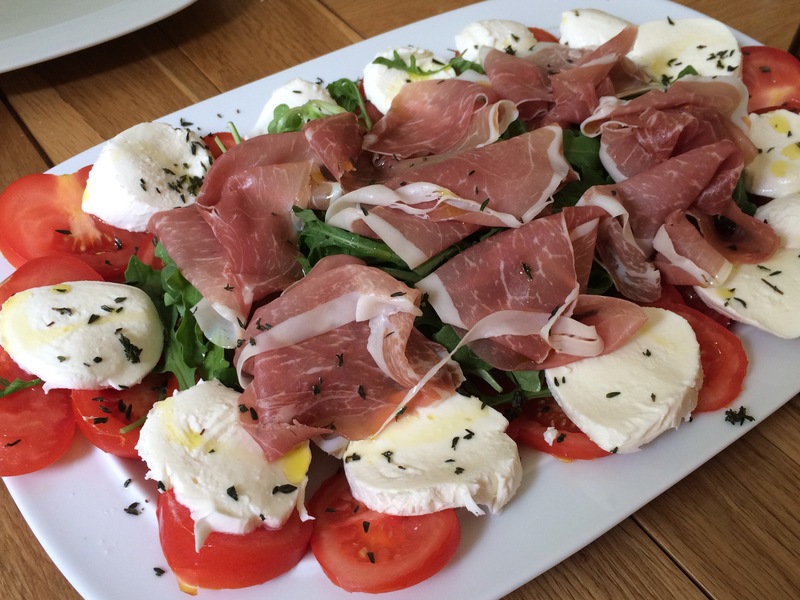 Lots of good food and drink (again) and good times spent with family (again). 24. 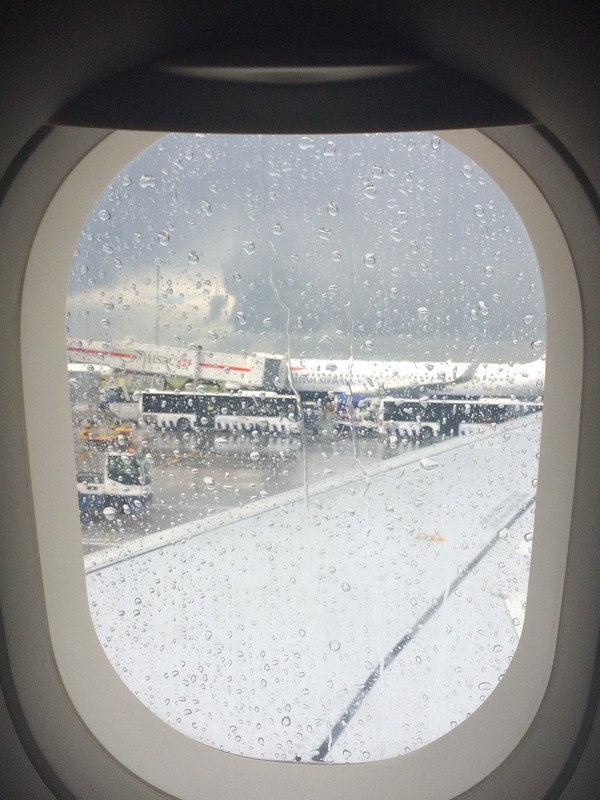 Landing in London to – you guessed it – more rain! 25. Still, we’re grateful to have Fifi to come home to. I’ve vowed not to leave her again as she has needed an emergency trip to the Vet’s whilst we’ve been abroad the last two times. She has recurring mammary tumours and a heart murmur which flare up frequently. Whether she’ll survive this latest bout remains to be seen, but at least she is comfortable and happy – for now. 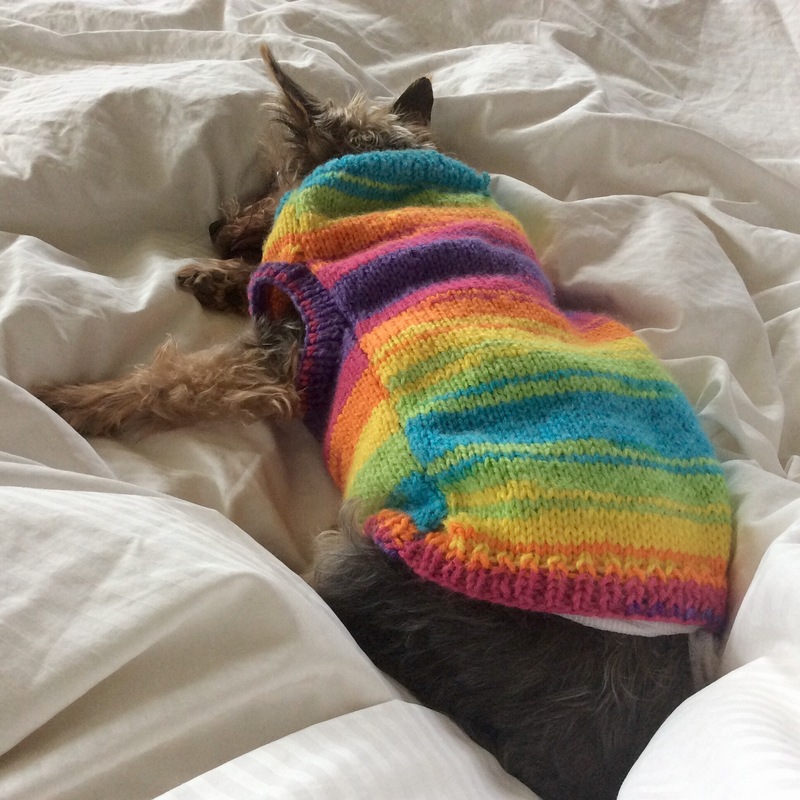 She’s lying on the bed beside me whilst I type this, snoring quite contentedly wrapped in bandages and her little rainbow coat. Categories: Sunday Sevens | Tags: crochet, Fifi, France, holiday, knitting, Paris, pub, Sundaysevens | Permalink. Wow! 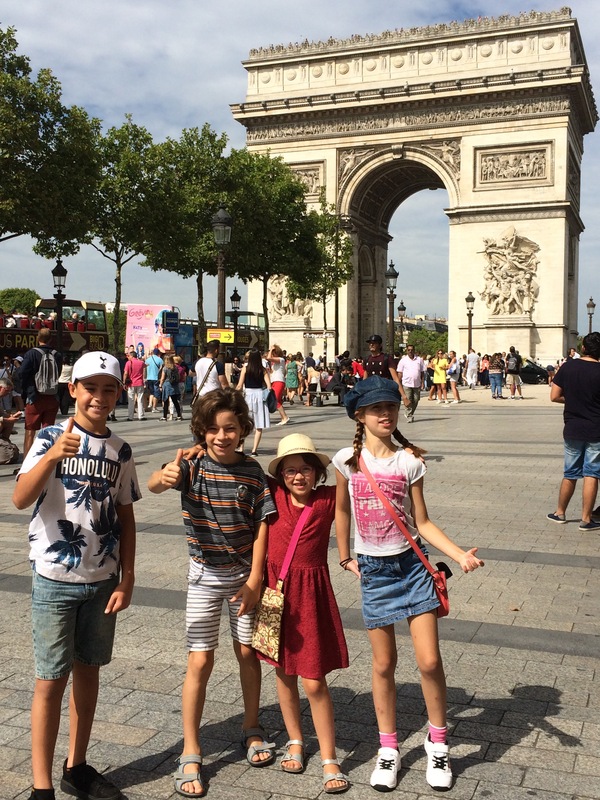 Looks like you’ve had a jam packed time, Paris looks fab, hope you thoroughly enjoyed yourself! Sorry that Fifi isn’t well 😦 but she does look very cosy in her nice bright coat. 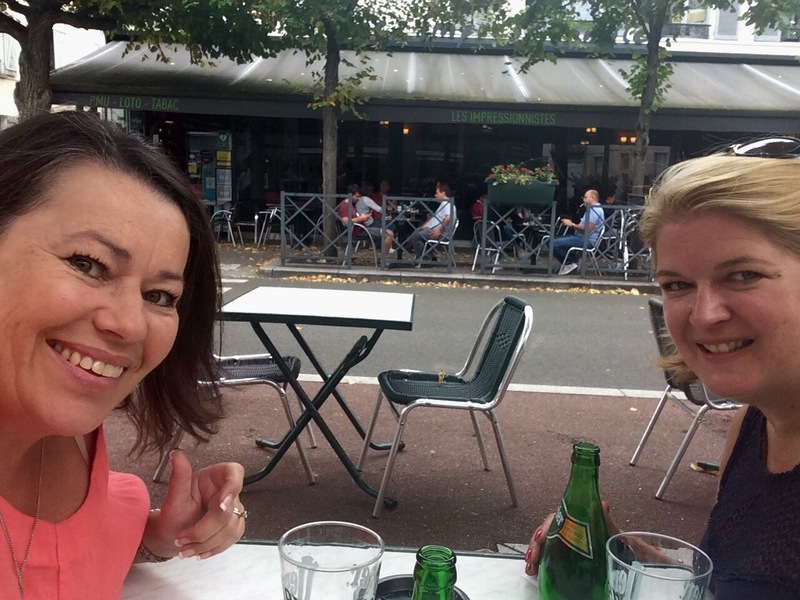 We had a lovely time in Paris, thank you, and have been a bit spoiled with holidays this year. Fifi has good days and bad days but is such a happy little thing that it’s difficult to know if she’s suffering at all, which I suppose means she isn’t. You should see her at the moment – I’ve basically wrapped a piece of fabric around her like a nappy so she can’t lick her wounds which are right at her back end. We have to take it off every time she goes out for a wee and put it straight back on again! It’s still preferable to the Cone Of Shame, though. I loved Paris when went there, it must be at elast twenty years ago. I long to go back to visit the Louvre, thanks for the memories. I love the way your boys always look as if they have been roaring around outside playing as boys should do. Glad to bring back happy memories for you, it was lovely to go back after a thirty-eight year gap. The Boys actually do roar around outside all day long as we give them very limited access to technology – and only if they’ve been active all day. Not that they look like they mind, do they?! As for the other pics, I think I put half a stone on just looking at them! I always enjoy your 7s. 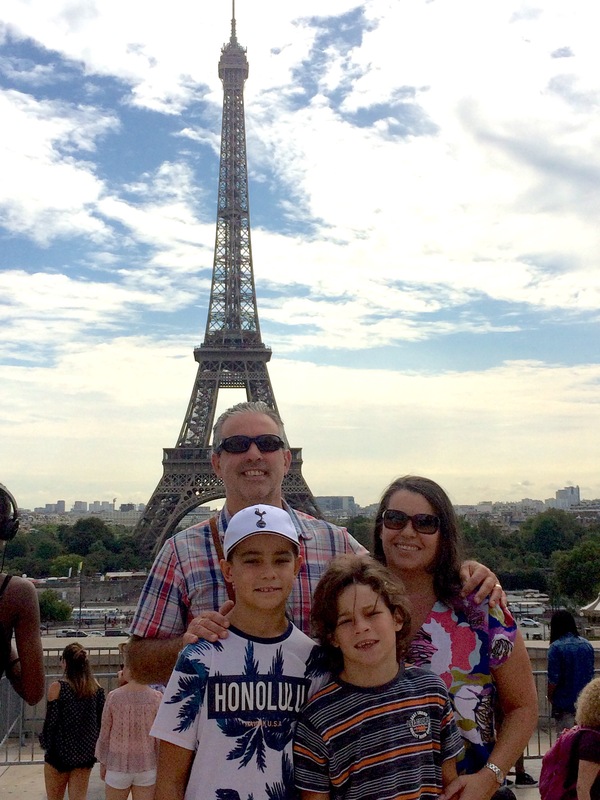 Thanks for the trip to Paris, brought back some happy memories. 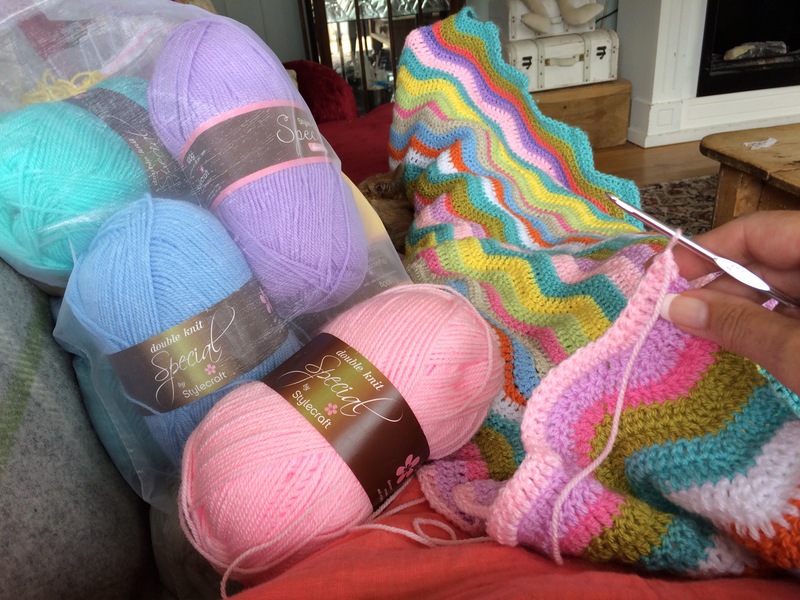 Lovely colours for your scrappy blanket. I have two thornless blackberries which are very disappointing cropping wise – any tips? Well, my mother taught me to always cut the branches down to the ground after they’ve produced fruit. The branches that haven’t produced yet are next year’s crop, so never cut those, just tie them up along the fence. That’s all we do and otherwise neglect it totally. Seems to work as we’ve had our biggest crop ever this year and it’s only five years old! Poor Fifi. In the famous words of Erma Bombeck, “Gettin’ old ain’t for sissies.” Hope she feels better soon. 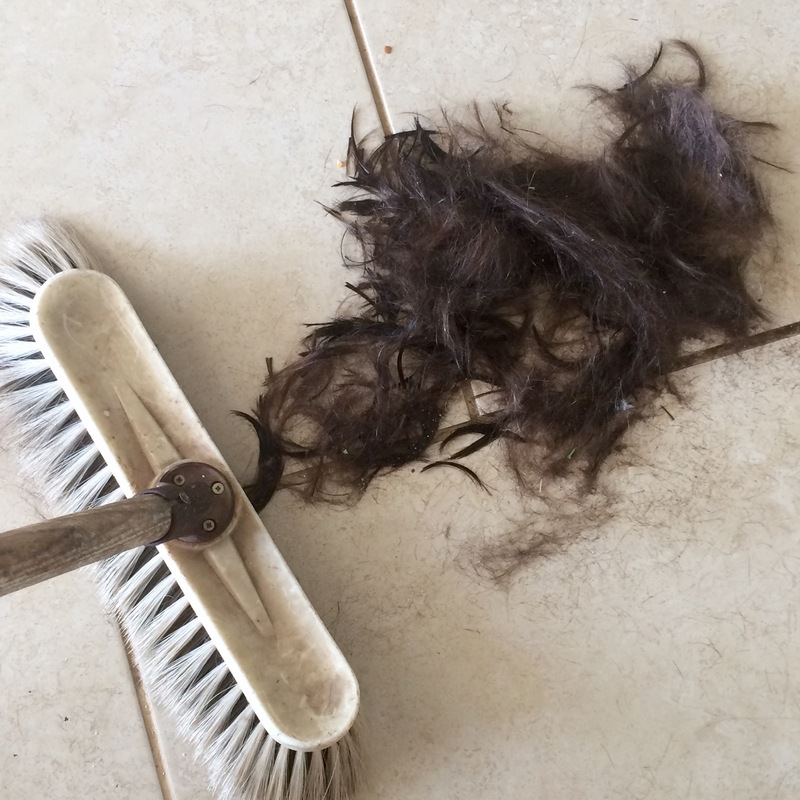 When I saw the pile of #2 son’s hair I thought “Hope Fifi isn’t in there!” 🙂 Your trip looked fabulous! I’ve never been to Paris and quite frankly, all I see of it now are terrorist acts on the news. Just horrible. When the news of Barcelona broke, I thought of you and were glad you were out of Spain. I admire your spirit – I’d of been so freaked out about possible attacks, I couldn’t have enjoyed the trip. I’m continually on the lookout for bags left unattended, people where they shouldn’t be or dressed oddly, and keep an eye for possible quick exits if needed. 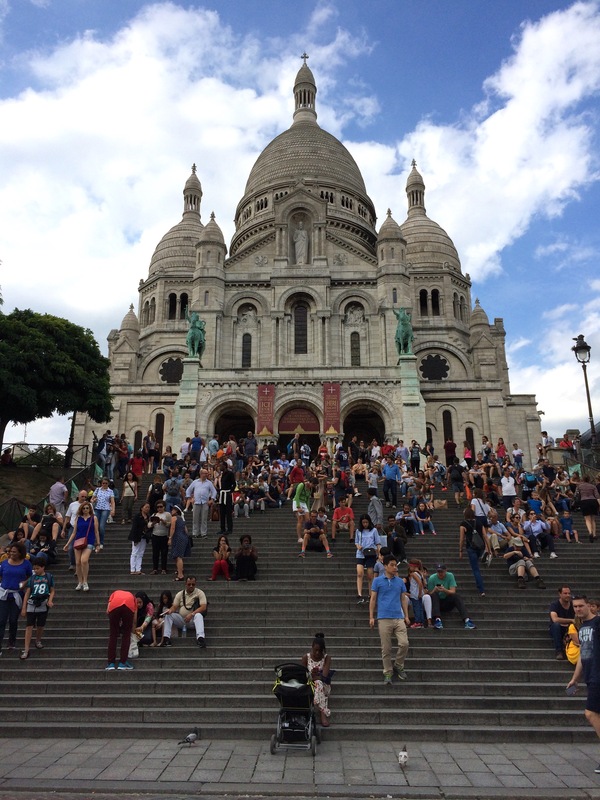 Mass crowds like the Sacre Coeur are a favorite target for maximum horror effect. I guess that’s just my military training creeping in. But to be there with my children? I couldn’t manage the anxiety. But we can’t quit living right? 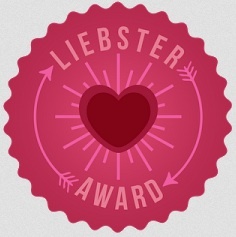 Love the post. And a sweater in August? It’s 98F here today. Great week at home as well, with lots happening. I can already see lots of work with the berries, but so worth it. Enjoy the new week, and I trust it will be pretty and sunny, for some part at least. Wow lovely trip to Paris it seems! 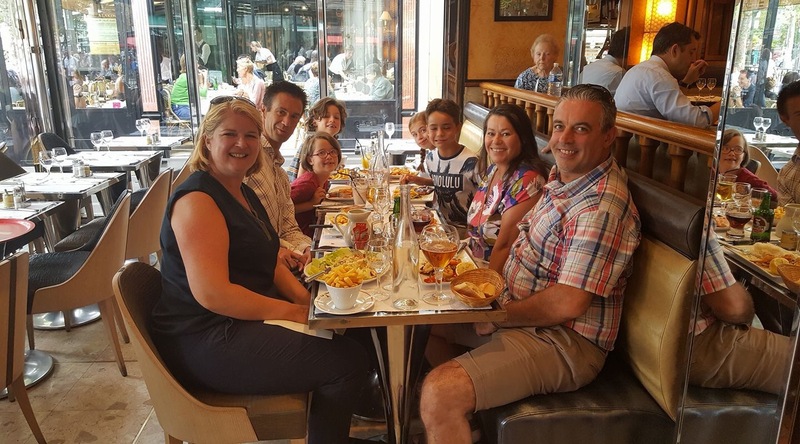 We were there again a few years ago – looks like we took the same trip – the view from the Sacre Cour steps was something else, Monmatre atmosphere, the food, my mouth is now watering and memories astirring! I had been as a chilid but as an adult it was even better. Thanks for sharing. Poor Fifi. I’m sorry she’s had another bout of ill health and surgery. I hope she’s feeling better.